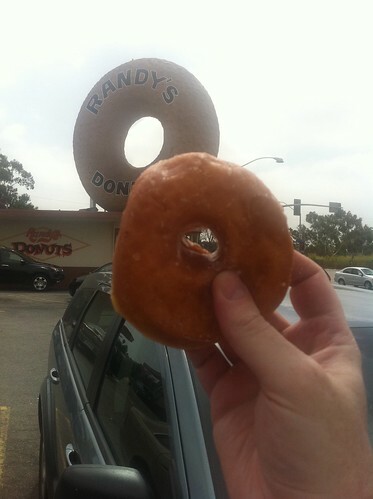 We had time for one breakfast stop before we caught our plane: that classic of mimetic architecture, Randy's Donuts. We shared a ham bun and an assortment of donuts. 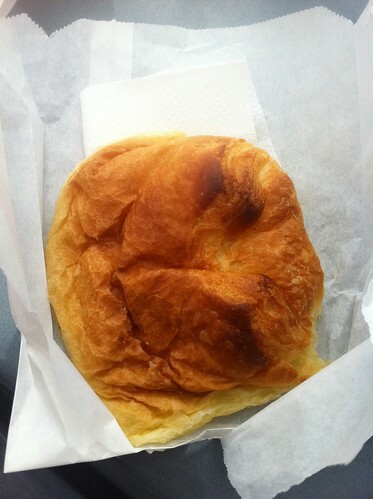 The ham bun was very good, with a soft, tender croissant enclosure. 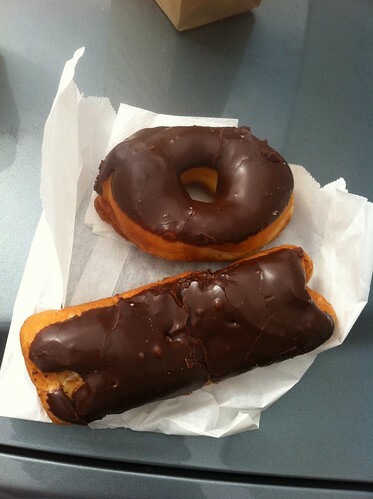 I remember little about Lori's chocolate-coated donuts. 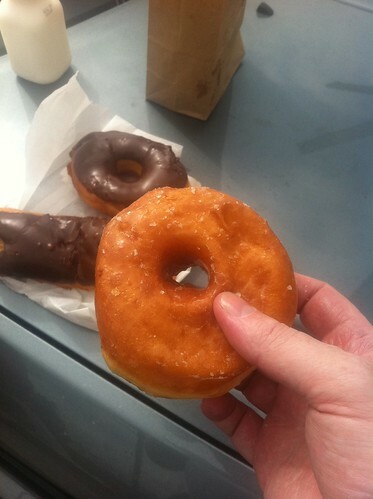 The plain glazed donut, though, was really splendid, far beyond my expectations. 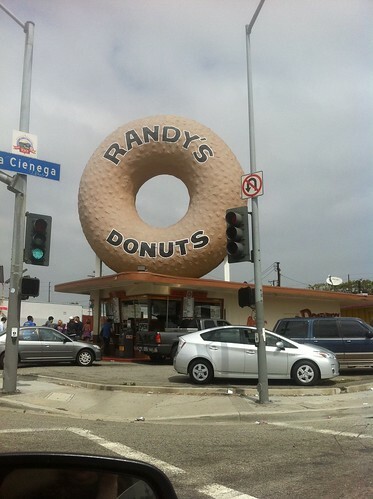 It was light and airy, but sturdy in a way that, say, Krispy Kreme donuts are not. After some debate, we decided that the best way to describe the texture was to say that it was the texture of a marshmallow. There's a wide range of variations in donuts that I do not notice, but this was really extraordinary. We had one incident of note on the flight back: At our stop in Charlotte, we were told that if we were continuing on to Pittsburgh, we could leave our carryon luggage aboard the plane. So we left our things in our seats and had a nice dinner at a restaurant next to the gate. We returned from the dinner twenty minutes before takeoff, only to discover that USAirways had changed its mind–the flight to Pittsburgh was now leaving from another terminal. The airline staff had at least retrieved our things for us, but we still had to dash across the airport and get to the gate only after everyone else had boarded. There was probably some legitimate reason for the switch, but it still left me feeling mad at USAirways. And so concludes my travelogue. I'd like to make one request: if you've enjoyed these trip reports, would you leave a comment here saying so? Many of my friends have told me that they like my reports, but I don't get a lot of comments on them. For the most part, I'm fine with that; I understand that most of my posts don't call for much comment, and I know that my posts are appreciated more than I see. But I am feeling a vainglorious yearning to see more of folks' enjoying my posts, so please indulge me.